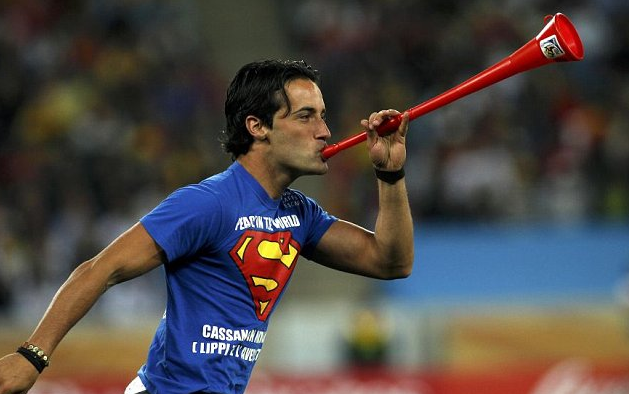 A one-man pitch invasion - complete with Superman T-shirt and vuvuzela - brought a halt to the World Cup semi-final between Germany and Spain after just four minutes of the match. 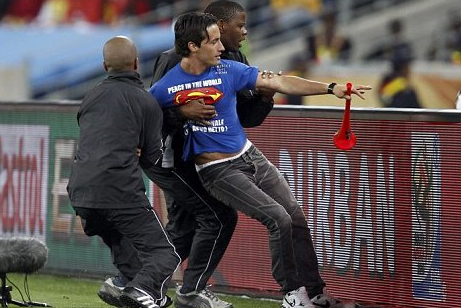 The individual, who appeared to be a Spanish fan, was quickly collared by security staff after escaping the stewards and running onto the field of play. The man seemed to have little intention of causing any harm to the players - despite getting within a few metres of Spanish striker David Villa and German defender Per Mertesaker. However, he still found himself harshly dealt with by stadium officials - three of whom surrounded him before hauling the man over the pitchside barriers and escorting him out of the Durban arena. The man's motives were unclear, although by his clothing and Spain scarf he appeared to be little more than a fan who had been enjoying himself just a little too much during the long day's build-up to the big game. The game - which is Spain's first ever World Cup semi-final - was restarted soon afterwards with a drop-ball, which Villa returned to the Germany defence.